Students come into school each day equip with different abilities, ethnicity, backgrounds, experiences, demographics, learning styles, interests, talents, passions, strengths and weakness. 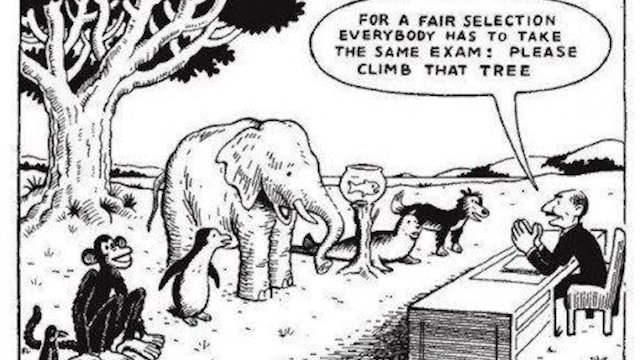 How can we as educators expect all students to perform the same task, at the same level, at the same time, when all of our students are at different readiness levels? Assessment is still a problem for most public education systems in the United States. There is way too much pressure for students to perform well on state standardized tests, especially when these tests are not an accurate reflection of student potential, nor success. The excerpt below is from the Innovative Educator and I could not agree more with Lisa Nielsen on this subject matter. This type of assessment closely resembles project-based learning. Project-based learning promotes inquiry and exploration, emphasizing creative thinking skills by allowing students to find that there are many ways to solve a problem. This instructional strategy provides students with the opportunity to create their own projects using their preferred learning style and interest, which allows for natural differentiation to occur. I personally believe all students can learn. Moreover, I believe that students can continue to learn and grow their entire lives. I believe that effort and hard work is more of an indicator of success, than intelligence. If students believe in themselves, they can do anything that they put their mind to. We as educators need to be providing our students with authentic opportunities for them to demonstrate their learning and understanding. And the assessments that we use to measure their learning and understanding should accommodate and celebrate the diversity of our students. So the next time you have your students "climb a tree", be sure that they have all the tools and the support that they will need to get to the top. And be sure to remind them that there is more than one way to climb a tree! Do you know who drew that original cartoon?